NOW’s Acidophilus Three Billion contains the bacteria Acidophilus which is a probiotic that helps the body to digest foods. Our bodies require certain types of bacteria to maintain healthy functioning abilities. In fact, Acidophilus is a perfect bacterium for people who are lactose intolerant, because it helps to promote the breakdown of fatty acids in lactic acid and helps it to absorb into the body. 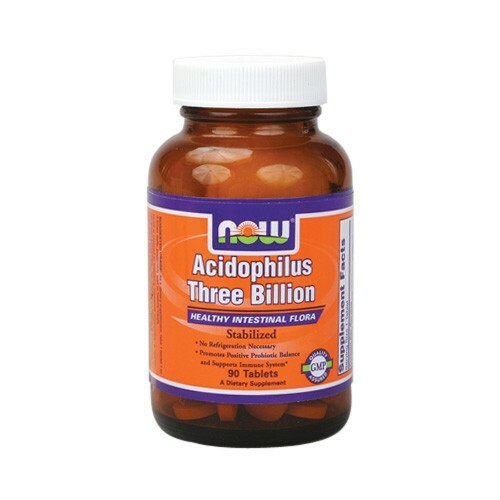 So keep absorbing those necessary nutrients through the use of NOW’s Acidophilus Three Billion supplement. Directions As a dietary supplement, take 1 capsule 1 - 3 times daily, preferable before meals. Warning Note for those highly sensitive to milk protein: This product may contain minute amounts of casein.